It had been a contrasting Hogmanay for the two respective sides. Selkirk had ended the year on a high in having demolished Vale of Leithen. Hawick Royal Albert, on the other hand, had closed the year on a low in being outgunned by Gala Fairydean Rovers. This opening game of the year, however, brought about a change in fortunes as it was Hawick who had something to celebrate. Parading two new signings in former Livingston, Brechin City, East Fife, Raith Rovers and Berwick Rangers midfield man Allan Walker as well as youngster Cameron Smith, who is on loan from junior outfit Bonnyrigg Rose, the Albert nailed their colours to the mast by emerging the better side. In doing so, the Hawick outfit picked up three precious league points in their quest to climb out of the relegation zone that they are currently in along with other clubs such as Selkirk. Hawick team boss Dean Shanks was well pleased with his side’s winning show and said: “We really needed that win. It was a must. Recently appointed Selkirk team boss Ian Fergus, who has guided his troops to a win and a draw in his two opening games said: “I am very disappointed with the result. “Hawick merited their win, but I don’t think there were three goals in the game as we gave an improved showing in the second half after having not been in the game a lot in the first half. The Albert took the lead with 14 minutes gone. After latching on to a Jon McInally pass, Hamish Hunter fed Sean Conaghan, who surged forward only to be dispossessed. Following a bit of ping-pong in the goalmouth the ball broke back to Conaghan and the Albert skipper took full advantage by shooting home. Selkirk replied with a sweeping raid that saw Kerr Scott burst through the middle only to be halted by a timely Smith tackle. Hawick were looking the more positive side and with two minutes of the first half remaining the visitors went further ahead. McInally doing the business with a shot that entered the net via the post after Selkirk number one Gregor Amos had diverted away a Josh Morris shot with an outstretched leg. Minutes into the second half, Amos denied Hawick a third with a superb save when diving to push a net bound Conaghan shot round the post. Selkirk began to make their presence felt a lot more from here on. Phil Addison had a goal chalked for offside before Ricky Miller came near to pulling a goal back with a speculative long distance effort that dropped just over the bar. Addison then had a shot kept out by Kyle Rankin, while at the other end Amos saved well from a McInally free-kick. In the 53rd minute the Albert completed the scoring. Ace marksman Morris grabbed his 23rd goal of the season with a perfectly taken penalty after Kris Mitchell had been brought down in the box by James Harley. 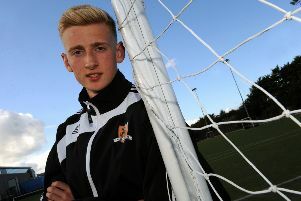 Speaking of his debut performance, new Hawick recruit, 16-year old-Cameron Smith said: “It was a great experience as I have never played in the Lowland League before.